Just this last week, I was reminded of how powerful simple can be as I read through nonprofit communicator Jan Gallagher’s recent enews, Simple is Better – and Cheaper. You can read it here. While you’re visiting her page, definitely take a moment to subscribe for regular tips on how you can communicate simpler (and, in turn, more effectively). You won’t regret it, I promise! 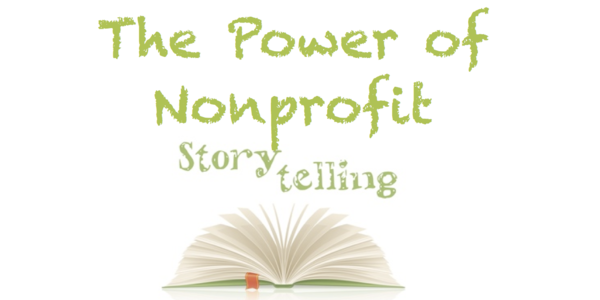 Nearly every nonprofit has to fight the impulse to try to tell people everything it does. (So do many companies and entrepreneurs, for that matter.) That’s especially true for organizations like my client, whose mission is genuinely complex and difficult to explain. Your work is really important. You want people to appreciate how much you do to accomplish your mission. You may imagine that you have to communicate this complexity in order to inspire people to support you. But you don’t. In fact, you can’t. Complexity is the enemy of communication. You can write (or talk) about all the wonderful things you do until the cows come home. But writing (or talking) isn’t communicating. Communication happens when the intended audience receives and understands your message. Unsurprisingly, The Redwood’s efforts in protecting women who’ve suffered at the hands of domestic violence is consistently difficult, and rife with its own unique challenges and obstacles. The Redwood offers a variety of services and options to victims of abuse in hopes that they can leave violence behind forever. Due to the nature of their work, there is a high level of client confidentiality involved and yet despite this, The Redwood’s donor report is peppered with emotionally-charged narratives. Their duty to protect the women they help hasn’t prevented them from sharing the powerful stories of those impacted by their organization. stop for a little while. Play happens. As hard as it is to picture, just for a moment, try to imagine a mother and her toddler son out on the street, alone and frightened after being kicked out of their home by an angry husband, the only father the child, young Geoffrey, has ever known. What could have led up to this and what were their lives like before they experienced such an uncertain future? 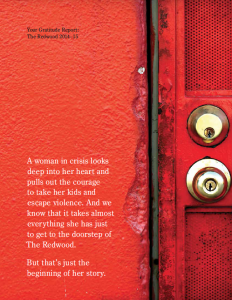 The story opens with describing The Redwood’s Play Room, beginning with hope before introducing the tragic story of a mother and two year-old who have lost their hope. But then, we learn how they were able to reclaim hope within the walls of a safe space, and how instrumental The Redwood was in making it happen. It’s painfully realistic and without any sugarcoating of any kind. The hope they find, thanks to The Redwood, is especially important to them in their time of need. Rather than being a magic cure all for each and every one of Andrea and Geoffrey’s troubles, it is something they both cling onto dearly during their battles to come. Life on their own is better and safer, and their relationship between mother and child has been given room to blossom and has, as a result, grown much stronger. How could I not want to help The Redwood continue the wonderful work that they do? Where would little Geoffrey and his mother, Andrea, be without them? Where would all of the many women and children who’ve been impacted by The Redwood be? Perhaps without any hope at all. And that’s a scary thought. A Gratitude Report isn’t merely an annual report with the title *gratitude report* slapped on it. Discover how to create your nonprofit gratitude report in Your Nonprofit Gratitude Report | Basics & More™, developed jointly by me and Jan Gallagher. Click here to learn more and enroll. The donor is crying. Now what?